Adopted on April 28th, 1960 the flag of Togo is the national flag and ensign. And I know I've done this one before at some time in the distant past (my lost blog, The Daily Quixotry) but apparently I've missed a few things because there's fun for everyone to be had with this flag. 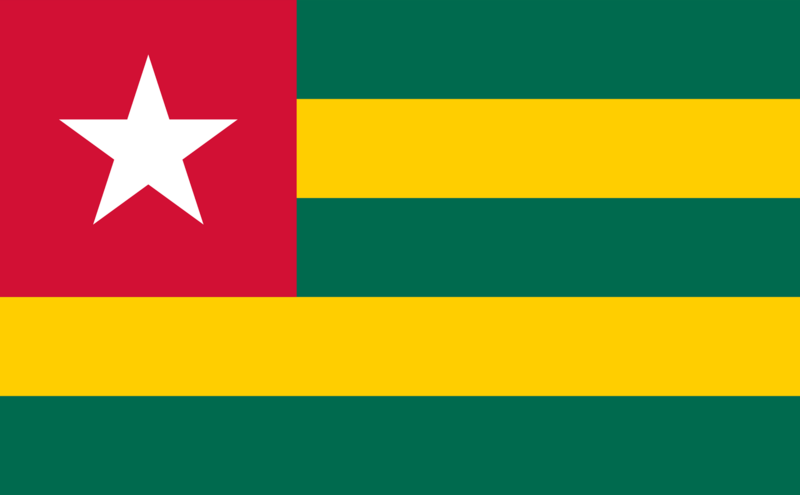 MATH NERDS: the sides of the flag of Togo are in the golden ratio and in fact, it's pretty close to a golden rectangle. The only other flags to have these irrational proportions: Nepal and Iran (if you're using the geometric construction. Whatever that means.) ART LOVERS: this flag was designed by Paul Ahyi, who's generally thought to have been one of the greatest artists of his generation. He's done a bunch of stuff, but this Independence Monument in Lome is actually pretty legit. The overall design also echoes the design of the flag of Liberia- which in turn, was modeled on that of the United States. How do the colors break down? Well, red stands for the martyrs blood that was shed to gain independence. White (and the star) both represent hope. Green stands for forest, agriculture, nature and overall hope for the future and yellow stands for the natural resources of the country. Colonially, the region once bore the somewhat distasteful name of 'The Slave Coast' for what should be pretty obvious reasons. (That's where the slave traders liked to find slaves.) And originally, it was Germany who moved into the area in 1884 establishing a protectorate. After World War I, rule was transferred to France who remained the primary colonial power right up until independence. President Gnassingbe Eyadema took power in 1967 after a military coup and held it for 38 years, making his tenure the longest of any African leader in modern history. Having established the Presidency as a family business by the time of his death, his son Faure Gnassingbe was elected President in 2005 after his death to succeed him. The upshot of this all is that Togo has been relatively stable since independence, but perhaps not necessarily the most open, friendly, democratic regime while it did so. Either way: it's got a pretty boss flag. So remember, until next time, keep your flags flying- FREAK or otherwise!